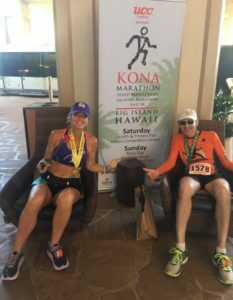 2017 Kona Marathon Race Recap Sunday morning June 25th, my first quarter marathon. 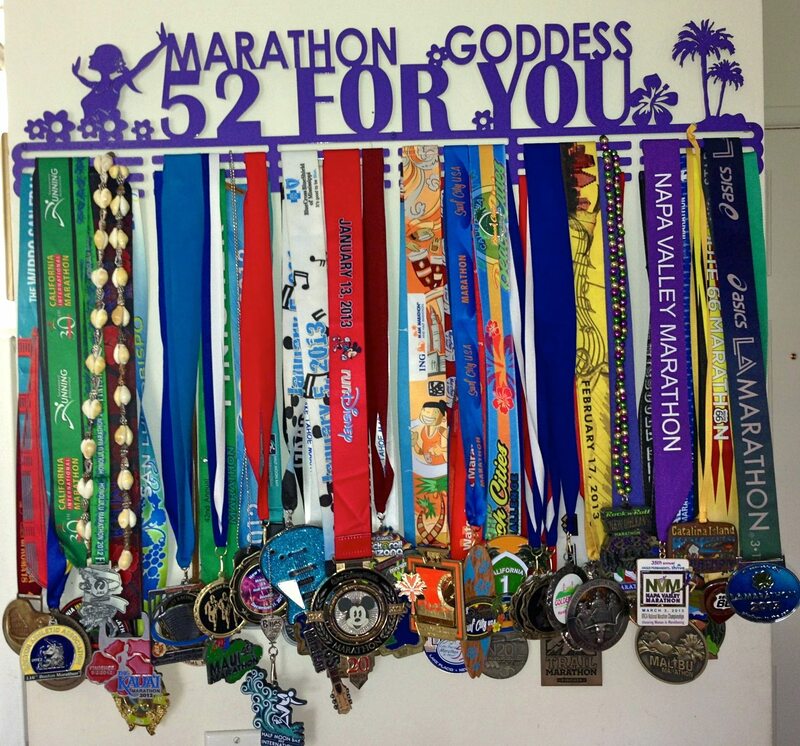 Yes, I have done hundreds of marathons, but it’s been a while since I ran one and I’ve never done a Quarter Marathon. 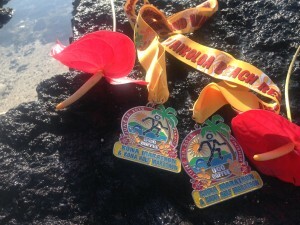 So, grateful the Kona Marathon Events offers not only a Quarter, but a 5k, Half and Full Marathon. Could I have done the half or the full? Sure. But I really wanted to be there to cheer on the other runners and interview the winners of the half and full. In addition, my training has not been quite up to speed, so this was perfect. 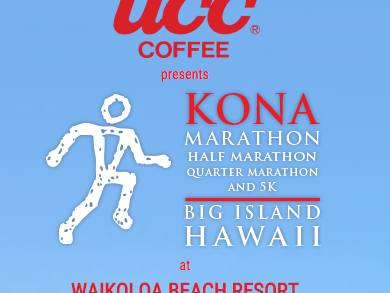 The start line is about 1 mile from the host Hotel, the Hilton Waikoloa. I just want to point out that the hotel is fabulous. Here are a few pictures of how amazing it is: The start line is near the Queens Market Place and there was a shuttle from the hotel to take you to the start. Of course, I woke up late and ended up running to the start line and wasting half my energy. Good job Julie. 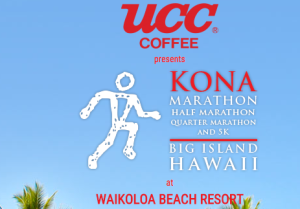 All I can say is, thank goodness for the UCC Kona Coffee that was waiting for me at the start line. 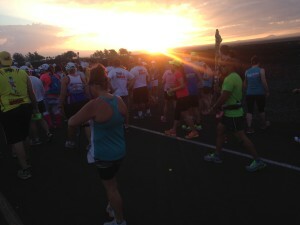 Other than my tardiness it was a magical start to the race. 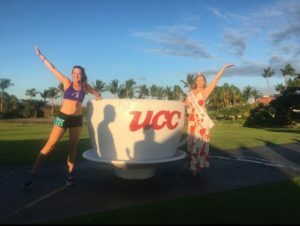 As the sun rose up over the mountains, Miss UCC Kona Coffee was there to add to the beauty and I was there to get it on video and capture all the exciting faces and spirits ready to run. I met a new friend, Megan, who was also running the quarter. 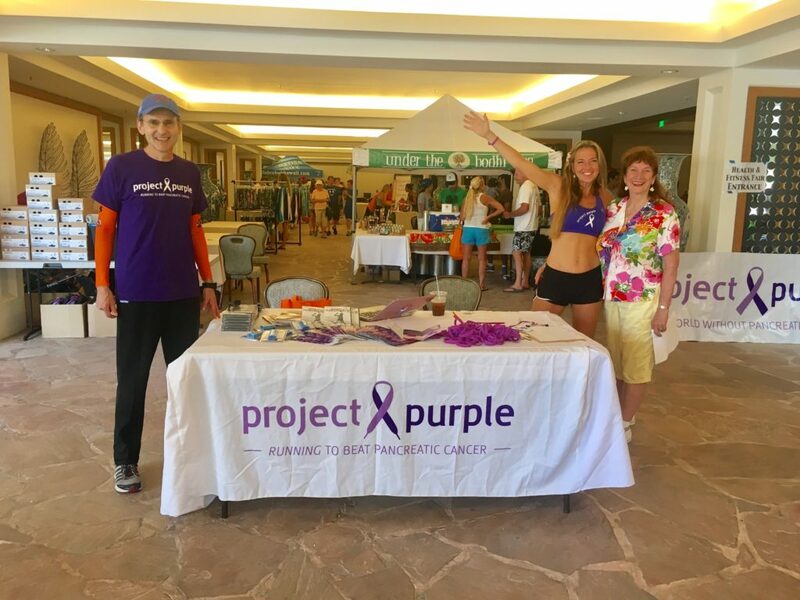 She turned out to be quite the speed demon and in my age group 🙂 I also met many friends at the Health & Fitness Fair on Saturday at the Hilton when they stopped by the Project Purple table. So many people have been affected by pancreatic cancer. 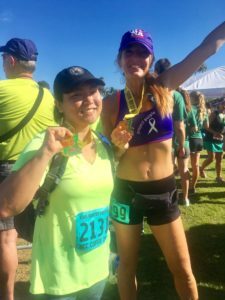 I was very grateful to be out there doing my part, advocating for a cure and representing the nations largest pancreatic cancer running charity. 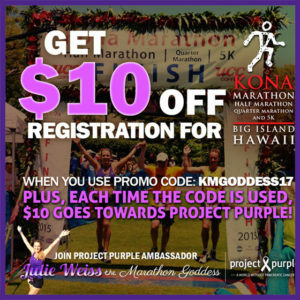 A huge mahalo to everyone who used the discount code KMGODDESS and especially the Kona Marathon for donating $1,160 to Project Purple. 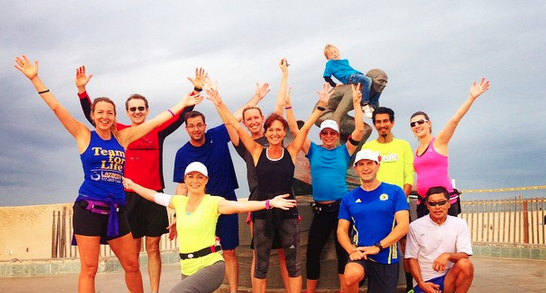 You were the runners who made it possible. So, thank you from the bottom of my heart for that. We are in this together. We even brought darling Amelia, my Grandbaby to help represent. It was now time to start the Quarter Marathon. It wasn’t too hot since the race starts nice and early and they have water misters to run through on the race course and I took full advantage of each one. The volunteers were out in force. 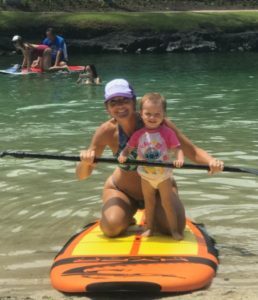 Very grateful to see their smiling faces and aloha spirit. 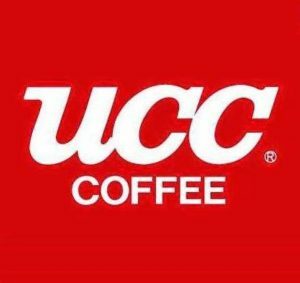 I bought some new shoes to give me that extra pep, but the only pep seemed to be coming from the UCC coffee I drank before the race. My shoes felt like I was running in snow boots. Good thing I was doing the Quarter. I tried running in the Hooka shoes for a few reasons, one because they were purple and two because I really thought they would be the perfect ones. Yeah, maybe if I want to climb a volcano but not run a fast race. I still ended up 3rd in my Age Group with a 10:20 pace. I will take it, since it was my first Quarter Marathon, that’s an instant PR, right? Don’t answer that. My friend won 3rd FOA and 1st AG. Maybe one day I will too. The winners of the Half were Christopher Rayder 1:17 and Holly Ballenger with a 1:35. 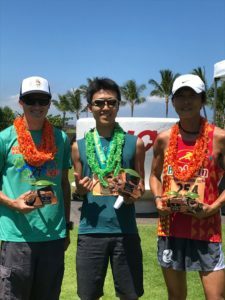 The winners of the Full were Kentaro Mesuda, 2:52 and Bree Wee, 3:08. I caught up with Bree after the race and was so honored to meet her, I could barely ask any questions, I was so nervous, but she was super nice and gracious. The finish line was beautiful, my husband David and volunteers helped decorate it, complete with flowers, local ferns and love. The finish line food was in abundance as was the aloha spirit of the Big Island of Hawaii. 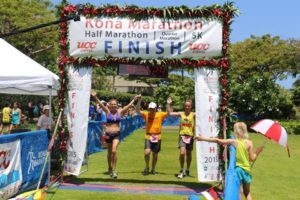 Kona Marathon Events on the beautiful Big Island of Hawaii is coming up. There are so many reasons to come and do this race, I don’t even know where to begin. 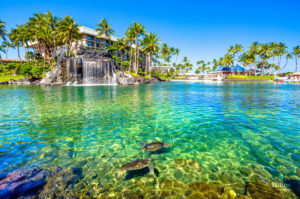 But I will start with the obvious, it’s in Hawaii! 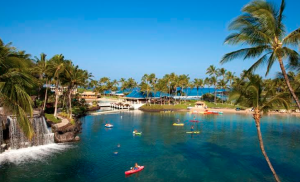 The race takes place in The Waikoloa Beach Resort and has the most amazing host hotel, the Hilton Waikoloa Village. The views are breathtaking and the restaurants are delicious. My favorite is the brunch. I think I ate there every day especially the day after the marathon when I may have eaten everything! 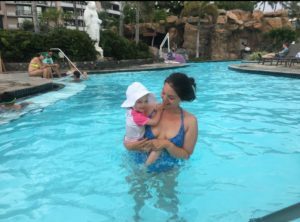 The hotel is kid friendly, I even took my Grandbaby along for the ride. 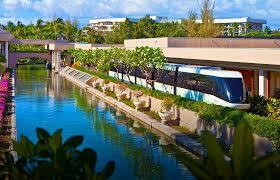 Speaking of ride, they have a boat ride and a monorail that goes through the hotel and takes you to your room – for free! The new course just keeps getting better and better. There is more shade and they have water misters along the race course which keeps you nice and cool. Love running through them, it’s so much fun. The Aid Stations are plentiful, stocked with hydration, ice, lots of volunteer smiles and aloha spirit. 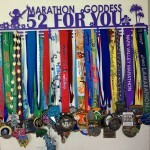 Also a great place to get your 50th state, or if you are on your journey to 50 as so many Marathon Maniacs are. 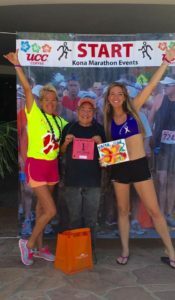 Pictured below is my dear Rock Star friend Mark Kramer, who finished his 50th state at the 2015 Kona Marathon. It was an honor to cross the finish line with him. There is a race for everyone. 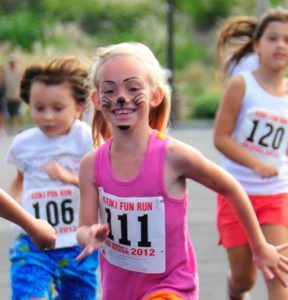 On June 17th they have the Aloha Keiki Run for kids ages 1 to 15 at the Kona Commons Shopping Center in Kailua. 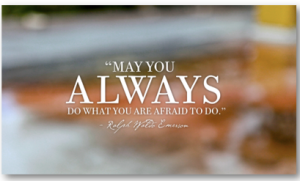 On race day June 25, they have a Full Marathon, Half Marathon, Quarter Marathon and a 5K and guess what? I have a DISCOUNT code for you! 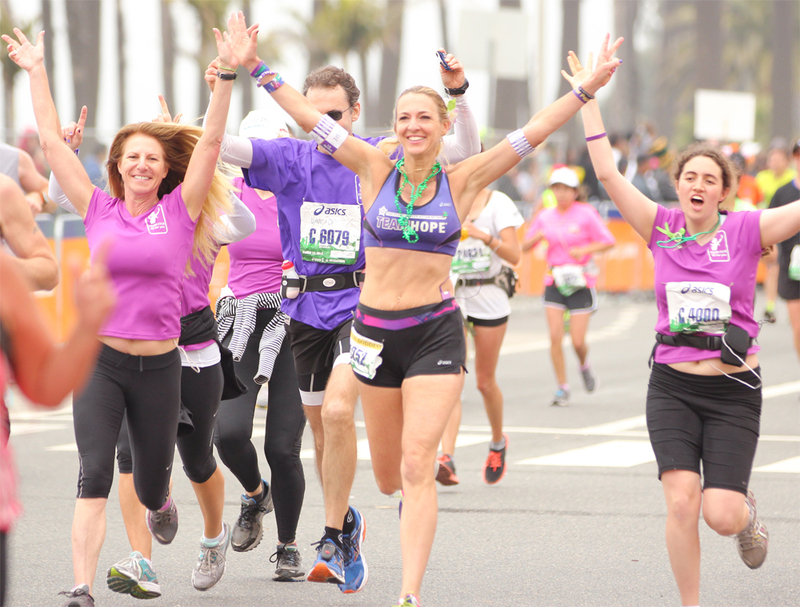 When you register, and use the code KMGODDESS you will save $10 off the full marathon or half marathon and $5 off the Quarter Marathon or 5K. 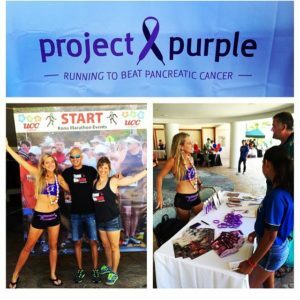 Every time the code is used the Kona Marathon will graciously donate an amount equal to the discount to Project Purple to help cure Pancreatic Cancer. It’s a Win Win!!! 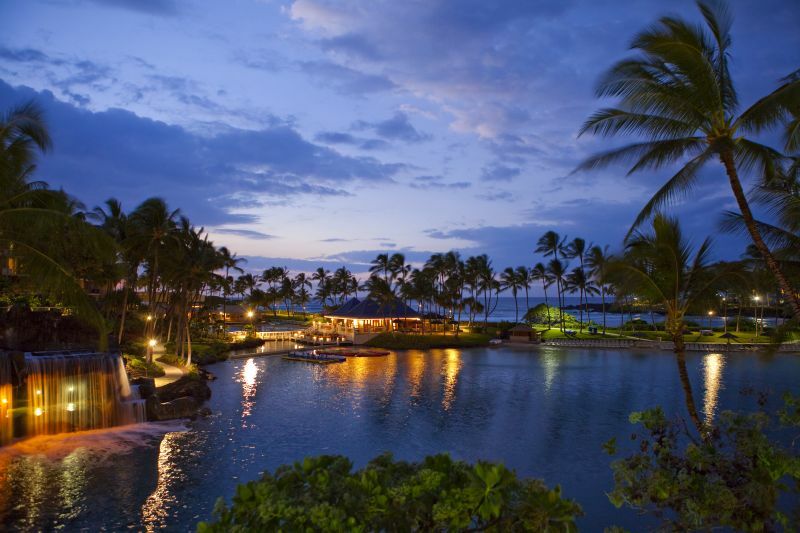 This will be my 6th year returning to the beautiful Big Island of Hawaii. 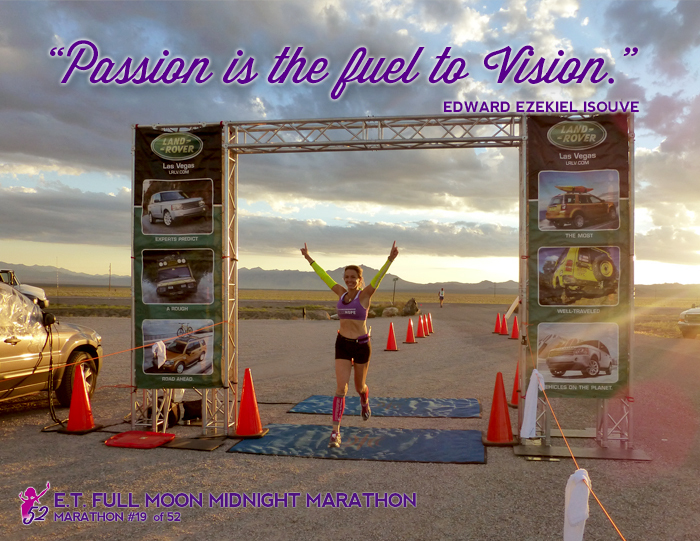 It was number 11 in my 2013 magical journey of 52 marathons in 52 weeks to raise funds and awareness for pancreatic cancer. I always say, “Number 11, like running in heaven” and it truly is. Come visit my booth at the Health and Fitness Fair on Saturday, June 24 at the Hilton Convention Center. 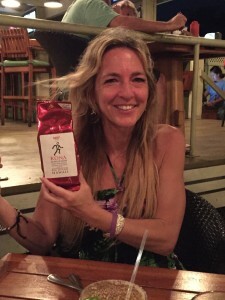 I am very grateful to be a Kona Marathon Ambassador. 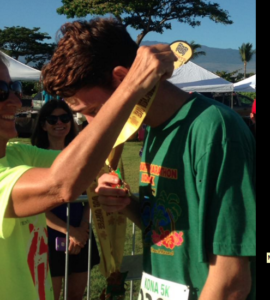 It is an honor to represent a marathon truly embracing that Aloha Spirit. I hope you will join me June 25, 2017. 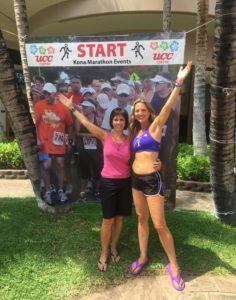 Come out and let your Aloha Spirit SHINE and I will see you at the finish line. 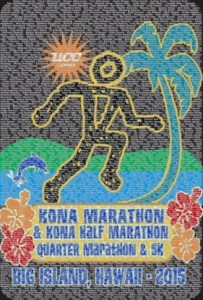 Register here: www.konamarathon.com. 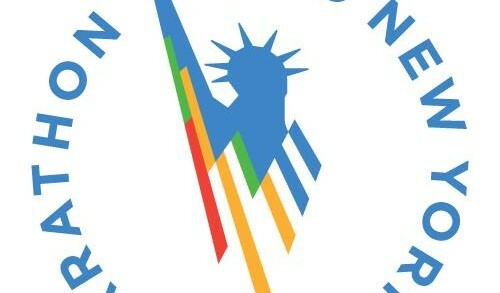 The 2012 New York City Marathon was supposed to be Marathon number 32 in my streak of 52 marathons in 52 weeks, but it turned out to be, “The Marathon that Never Was.” Now some 40 marathons later, we’re back and still going strong. Marathon 96, in my new Purple ASICS! 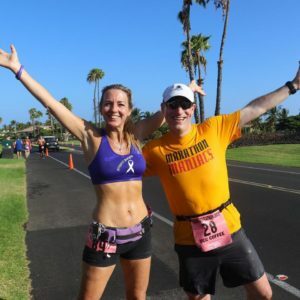 Here’s a great example of what my life was like during the 52 marathons in 52 weeks, although this example is a little extreme. Take The 2012 New York City Marathon. You may be thinking, there was no New York City Marathon in 2012. That is correct, because about 1 hour after we landed in NYC and checked into out hotel; we found out, due to Super Storm Sandy, the marathon was cancelled. Now what? 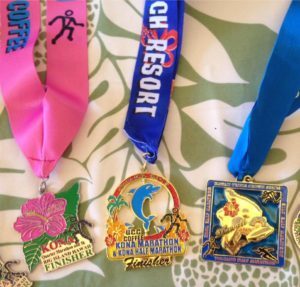 To keep the streak alive, I had to run a marathon that weekend. 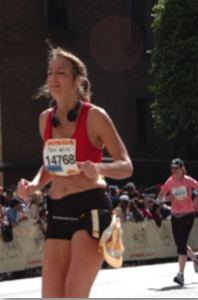 I wrote about my New York Marathon Experience in my blog titled: The Marathon that Never Was! 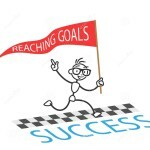 “It started as an exciting adventure, which quickly took a sharp turn. As super storm sandy slammed down on the east coast, it took a piece of my heart along with it. For me, I went to New York to run, along a with so many others, to show the American people that we are a courageous people in the face of heartbreak and recommit to hope and possibility when things are the hardest. But it wasn’t meant to be. We arrived on Friday at JFK. In the cab ride to our hotel our driver was telling us all the horror stories going on. Generators and back up generators were sitting there, not being used, and in place for the marathon. Meanwhile there were still millions without power and shelter and some without food. My heart sank. As we got closer to the hotel I saw a two mile long line of cars waiting for gas. Then I see a hanging crane dangling over the city streets. Wind had broken the massive steal crane, dozens of stories above the city streets. If not for the wires holding it, the top of the crane, dangling 100s of feet above, would have crashed to the ground. 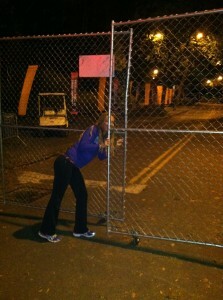 The streets were barricaded off and no one was allowed within a block or two. I sank deeper into the floor of the taxi. What other horrors were we in for, I wondered? We arrive at our hotel and get a quick bite and we are ready to head to the expo for a great opportunity and interview with Poland Springs water. I had CBS/KCAL news following my marathon adventure in New York, which quickly became more interesting to them because within just minutes after we arrived at our hotel, we hear a rumor that the marathon was cancelled. The rumor quickly became a reality and honestly my first reaction was a sense of relief. The next thing I did was order a drink and console friends. There was a young woman, who had also just arrived, and similar to us, also had not been to her room yet. She had come all the way from London to do the New York Marathon. Ouch! She was horrified, in a sad and quiet way. Now I had to figure out the next plan of action. Quick find another marathon! 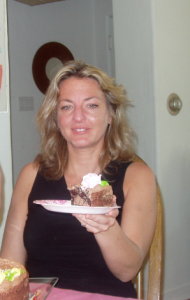 I called friends, posted on Facebook, someone please register me for the Santa Clarita marathon in California. I knew it was on the same day as New York. Next, get a flight home. 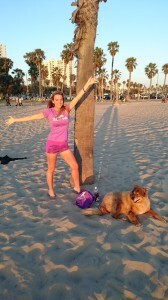 Called my travel agent and we booked the first available flight, back to LA, the next morning. We made the best out of our 12 hour stay in NYC. I had a big press conference with the New York Roadrunners and a photo shoot which had all been cancelled. A fantastic article in the official program was printed in mass. Thousands of them, that no one got to see. L It would have been huge for Pancreatic Awareness. We then had a nice dinner with David’s family, snuck into Central Park and did a quick bandit run. The finish line had mostly been erected, but now completely abandoned. With absolutely no one around, at night, in minimal street lighting, we ran the finish line of the New York Marathon. Somehow, with no one there to give us a medal or even notice, it still felt good. There is something special about a finish line, even one not fully assembled. Early next morning we hop on a plane back to LA, with little to no sleep. 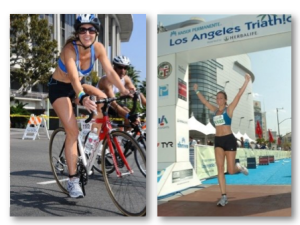 Once arrived, we immediately drive to the Santa Clarita marathon expo to register. After another few hours of sleep, Sunday morning, I am off and running the Santa Clarita marathon, #32 of 52. The 52 lives on and the people of NYC were heard. On the way to my marathon I heard that thousands of marathoners were on the ferry to Statin Island, to help out the now homeless and displaced. Though the storm had destroyed the hopes of the marathon, the marathoners had brought a little hope to those in need. That made my heart sing. 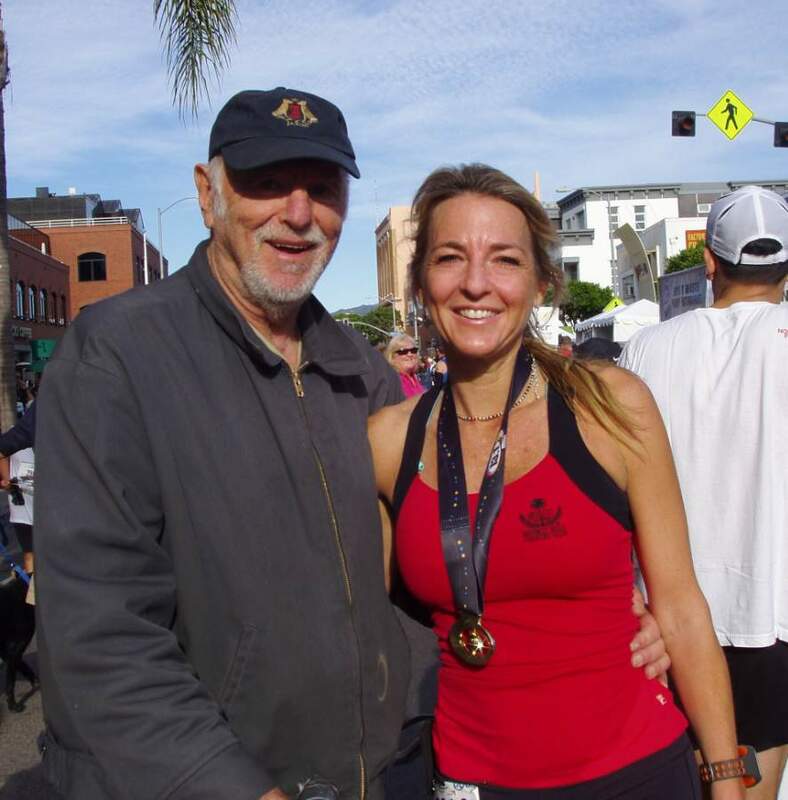 Santa Clarita marathon was hot and fun. It was not NYC. We had 500 marathoners vs. 50,000. I ended up running 28 miles. At mile 14 I went back to help out a friend who was ready to quit, which gave me the extra miles. 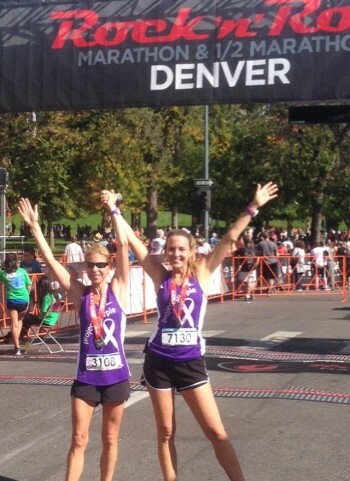 This marathon adventure was a bit crazy, but nothing as hard as the fight against Pancreatic Cancer. Here is a picture of me sneaking into Central Park the night the race was cancelled to run through the finish line and on the right, here I am finishing Santa Clarita that same weekend. Nothing would stop us, not even Super Storm Sandy! 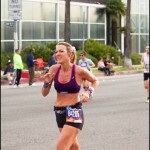 The Santa Clarita Marathon, marathon 32 of 52! We did it! 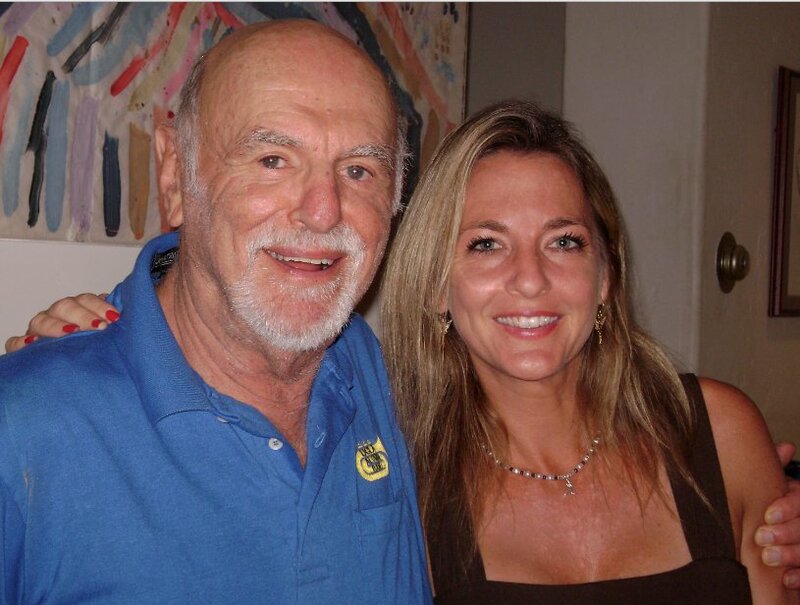 The New York Marathon will always be special, not only because of the amazing spirit and the people, but my Dad was from Brooklyn, I know he’d be proud and I know he’s still here with me. 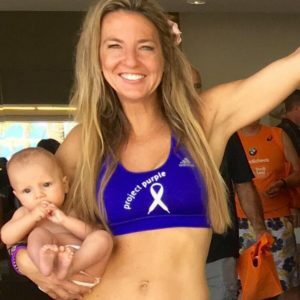 Next week is Santa Clarita Marathon, next week!? Here we go again!! We Got This! 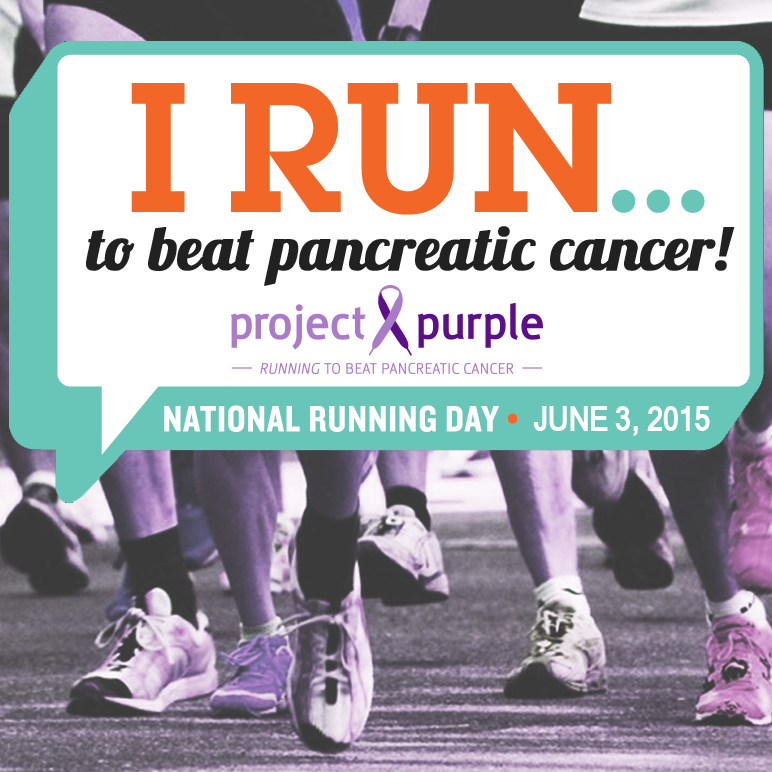 Please donate today and let’s put pancreatic cancer out of business! Thank You! 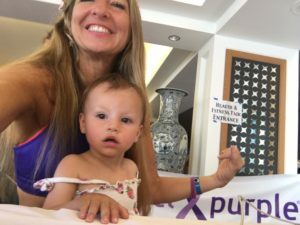 Click here to donate to Project Purple! 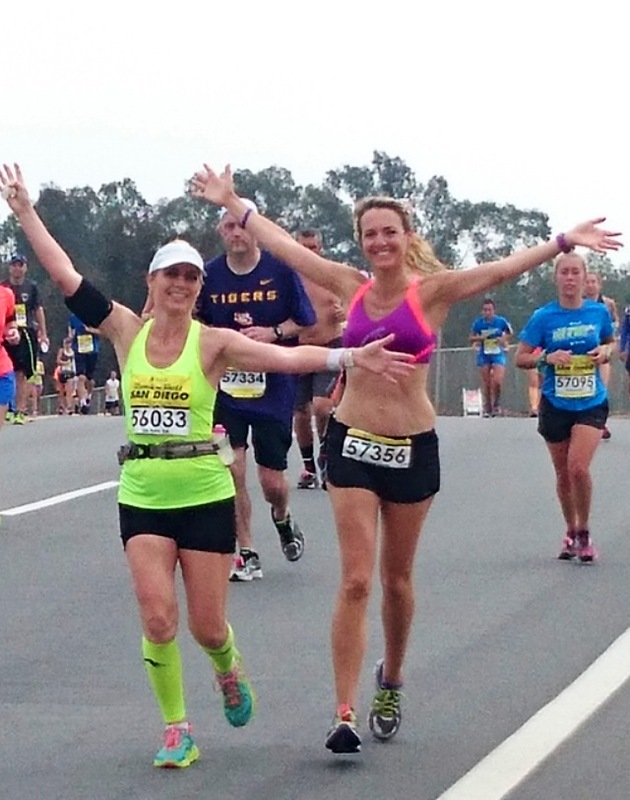 How to survive back-to-back marathon marathons! 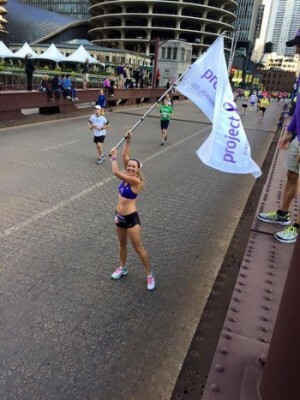 Photo Op with the Project Purple Flag at mile 3 in the Chicago Marathon. Fun!! 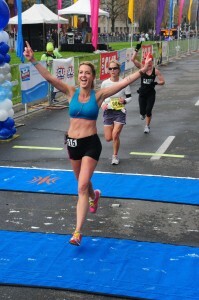 Then there was the RocknRoll Denver Marathon one week later. I knew it was going to be slow with the altitude and heat and it was just that.I finished in 5 hours and 20 minutes, with a smile on my face and a skip in my step. 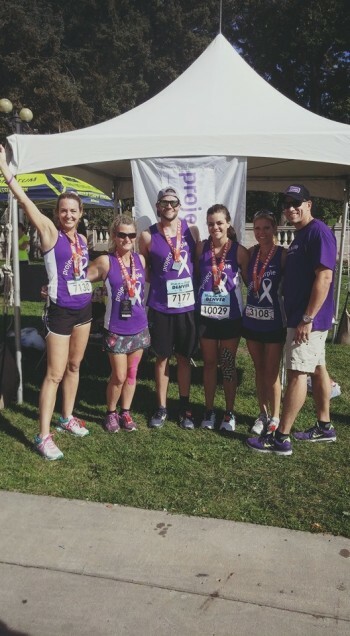 Partly because I had my Project Purple Team waiting for me at the finish line, I was thinking about all the amazing pancreatic cancer survivors I was running for. 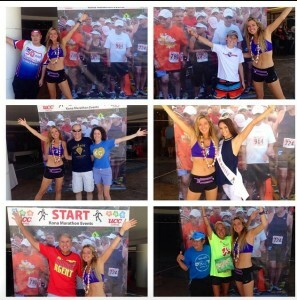 Awesome to have friends at the finish line!!! The Project Purple Team. 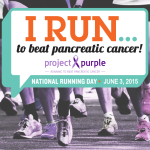 Running to BEAT pancreatic cancer! 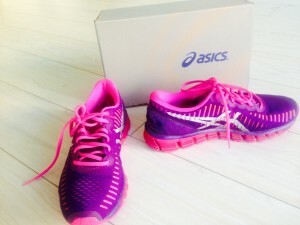 Now with just a few days left before the New York City Marathon, I am getting excited, not only because it’s one of the top marathons in the world, but also because I just received my brand new kicks, for marathon 96, my new Purple ASICS! Good thing too because the Santa Clarita Marathon is the follwing weekend. 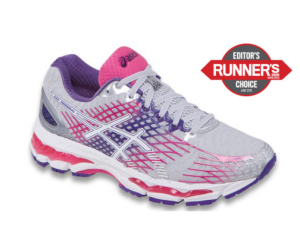 Marathon 97 with these ASICS will be like running in Heaven! Check out these Awesome Gel- Quantum 360s!!! 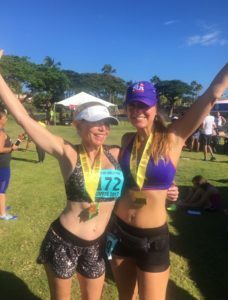 Why I’m running 100 Marathons? We Ran the Rock!!! 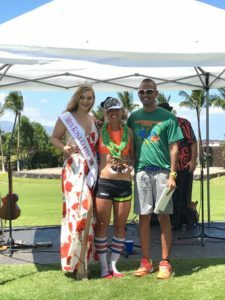 It was 95 degrees with nearly 100% humidity, on a record setting day in Kona. But we ran the Rock or shall I say, we Survived it!!! 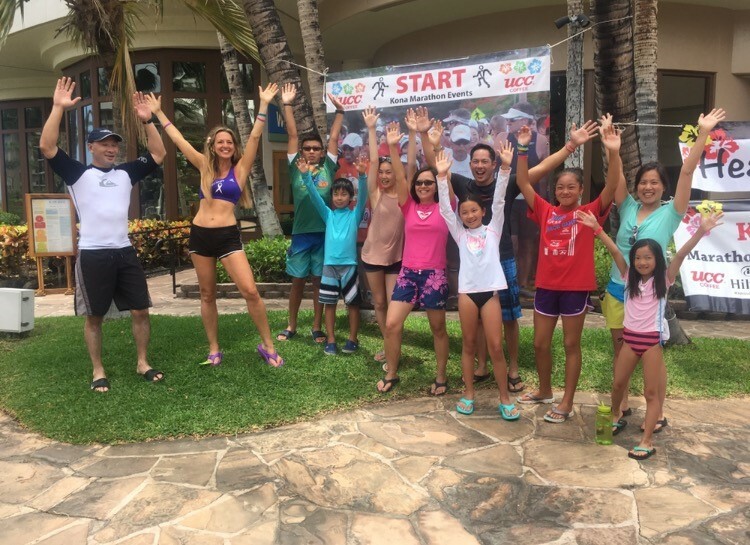 Despite the heat, The New Kona Marathon is better than ever! Yeah!! 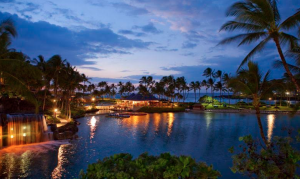 Upon arrival into The Hilton Waikoloa Village Beach Resort, I was excited to see the Queens MarketPlace. A beautifully landscaped village with shops galore, eateries and more. Lush trees and gardens lined the streets which made me even more excited to know we would be running through there. 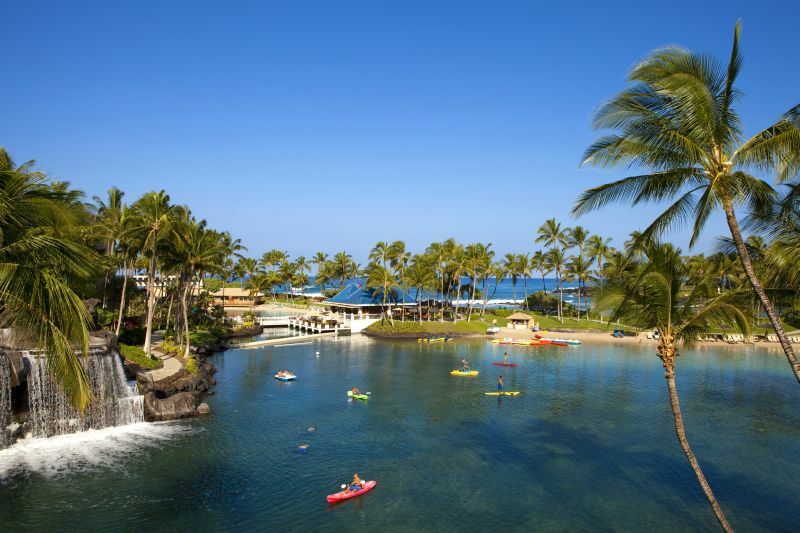 We arrived at The Hilton Waikoloa Village Beach Resort and I can’t say enough nice things about it. 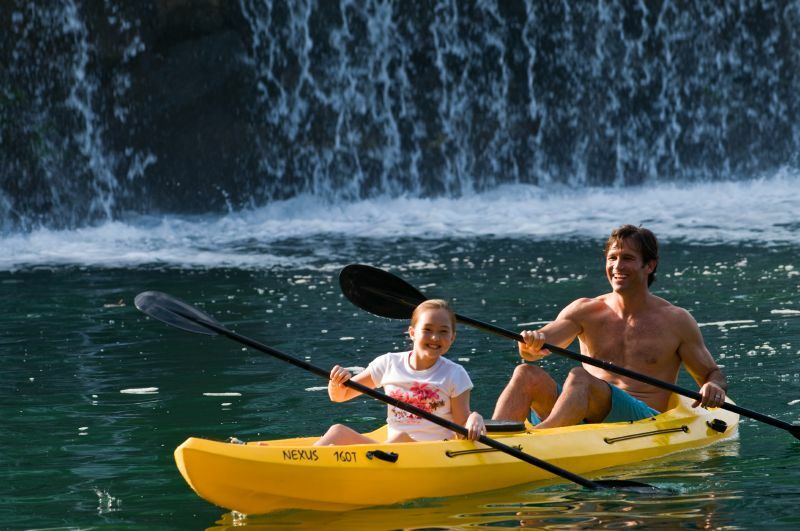 They just placed number 4 on Travel & Leisure’s 2015 World’s Best list for Family Travel. I can see why, first off, it was BIG, like amusement park big. 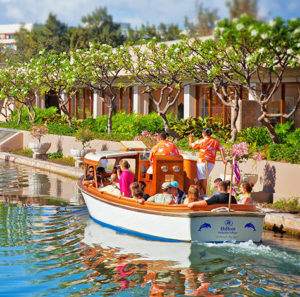 There were dolphins, a giant lagoon that fed into the ocean, water slides, pools, boats, even a monorail, yes you read that right. Even with the magnitude of this hotel, everything was centrally located and easy to get to. Ancient artifacts decorated the hallways within the hotel, it was like walking through a museum. The EXPO- This was one of the BEST expos I’ve ever been to (and I’ve been to a lot). The expo was located at the convention center at the The Hilton Waikoloa Village Beach Resort , it overlooked the waterfall on the lagoon, it was breathtaking. 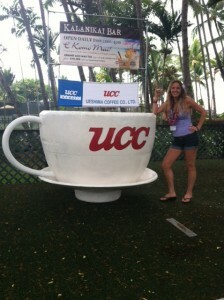 Everything was so well organized, the vendors were great, including UCC Coffee, the best Kona coffee ever. 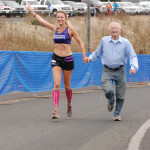 The Big Island Running Company was there and even gave me a purple shirt. Here I am representing in Santa Monica: Also, The Kona Marathon running logo apparel was so hot they sold out within a few hours. 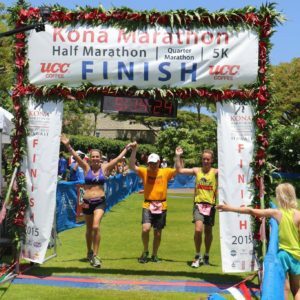 However, you can still get the Kona Marathon Towel with your name on it (if you registered before June 12), click here: Kona Marathon Towel You could feel the excitement and Aloha Spirit in the air. 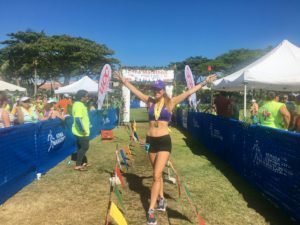 It was an honor to represent Project Purple, the Nations Top Pancreatic Cancer Running Charity, Essence Water ph10,Worlds Best Alkaline Water, and take Goddess Pose photo’s with so many friends in front of the Kona Marathon Start Line Back Drop. 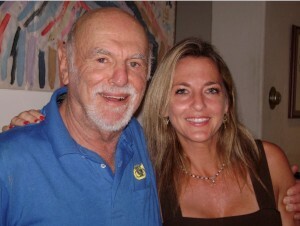 My Thoughts on this Father’s Day! 1. 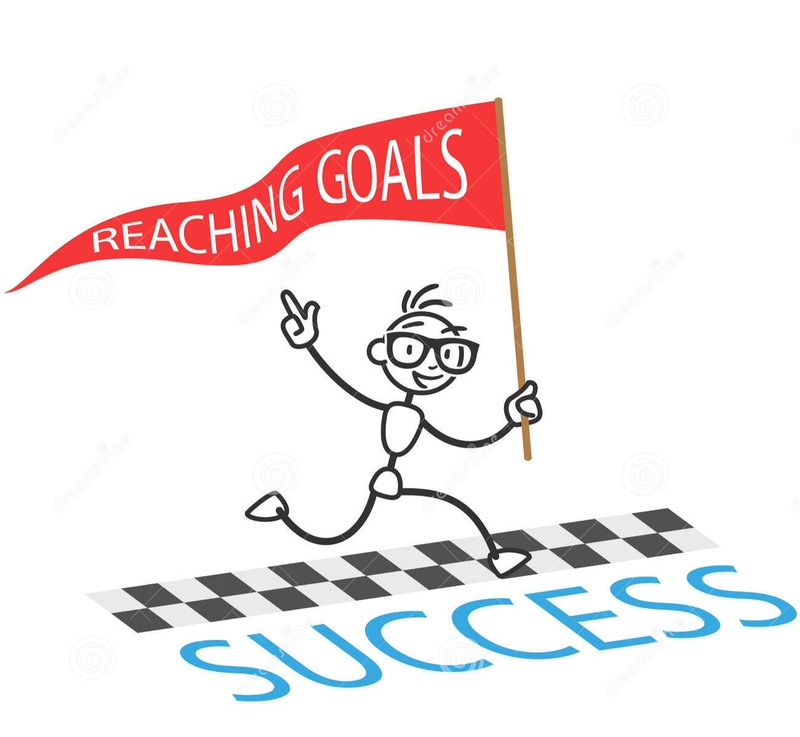 Running gives me goals to motivate me. 2. 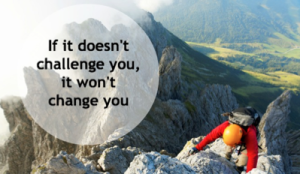 Running challenges my inner being. 3. 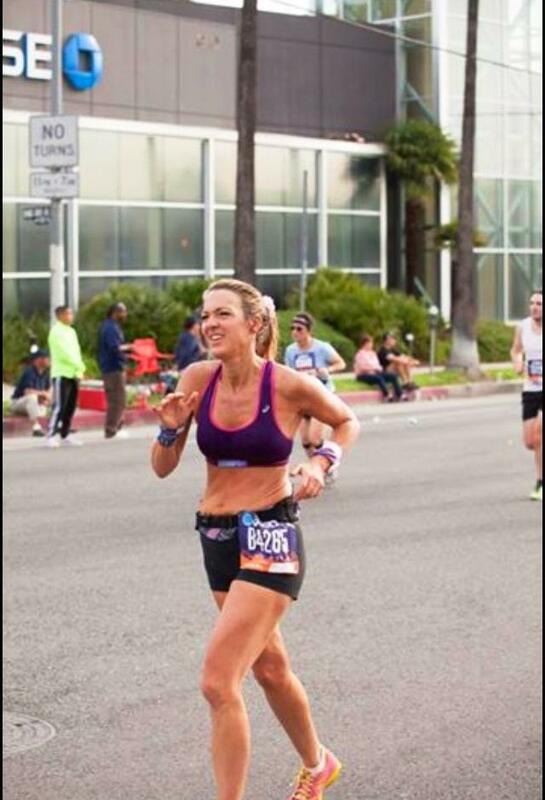 Running gives me a sense of accomplishment. 4. I run so I will no longer be depressed & overweight. 5. I run for medals. . 6. 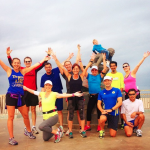 I run to be with friends 7. I run to be the best version of myself. 8. 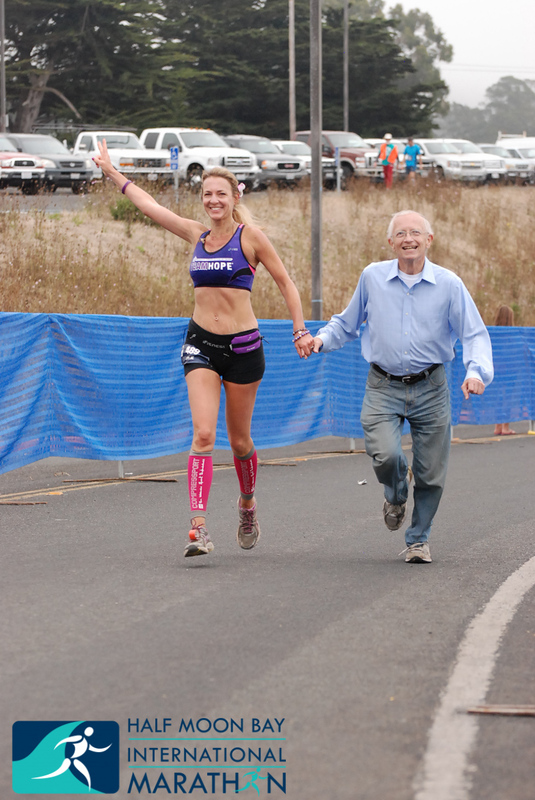 I run to make my Dad proud. 9. Running heals my soul. 10. 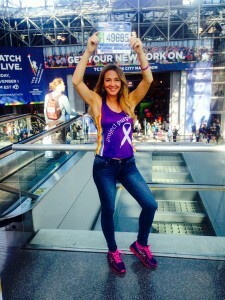 I run to beat pancreatic cancer. 11. I run for those who can’t. 12. I run for Hope. 13. 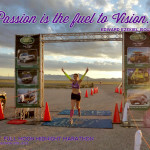 I run to inspire the world. 14. Running makes me feel Alive. 15. I run to find my own sunshine. 16. Running makes my spirit shine. 17. Running makes me Happy. 18. I run to show people anything is possible. 19. 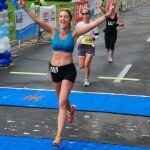 I run to qualify for The Boston Marathon. 20. Running pisses me off 🙂 21. I run to have fun. 22. I run to find inspiration. 23. I run to stop thinking. 24. I run to get places. 25. I run to cross finish lines. 26. I run for life. .2 Just run! 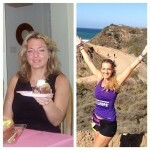 I run the extra mile for these amazing foundations to cure pancretic cancer. Please donate if you can. Thank you! Happy National Running Day. 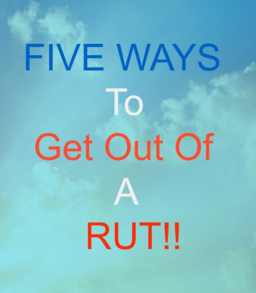 #GoRunItJune3 We Got This! 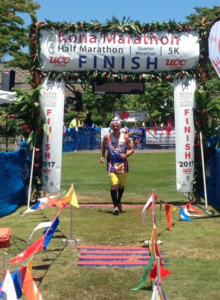 Exciting Things Happening at the 2015 Kona Marathon! As the Kona Marathon get’s closer, the more excited I get. 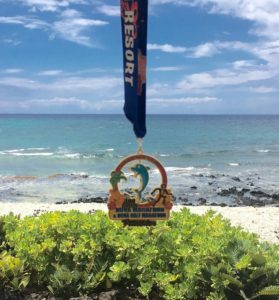 I wanted to share just a few more of the amazing highlights of the Kona Marathon with you: The 2015 Kona Marathon will be located at the Waikoloa Beach Resort on the Kohala Coast. 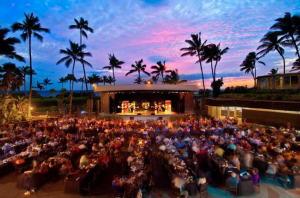 The race will start and finish at the Waikoloa Bowl at Queen’s Garden. The Marathon course has some moderate hills, never exceeding 290 feet above sea level with gentle climbs and drops. That sounds great to me! 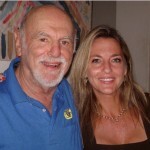 I will be running with one of my good friends, fellow Marathon Maniac, Mark Kramer who I met on my journey of 52. Sadly he lost his mother to pancreatic cancer. We are brother and sister in Arms. 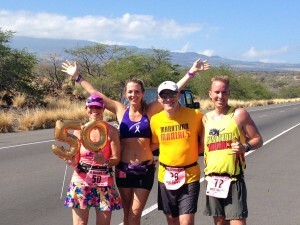 This year he will be finishing his 50th state with his good friend at the Kona Marathon. The 3 of us will run together, estimating about a 4:30 finish, but more importantly, crossing the finish line all holding hands, signifying that you can do anything you put your mind too, anything is possible, including finding a cure for pancreatic cancer! 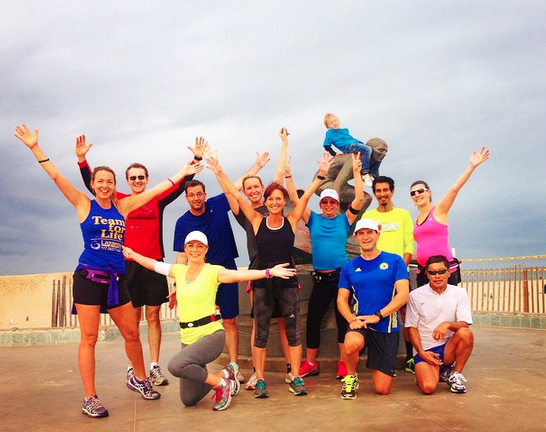 What do you do when you are not running? You shop and eat of course. 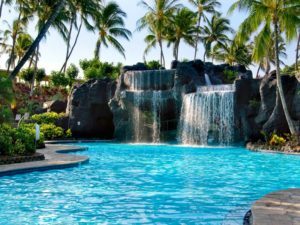 There is a fun family life style resort destination shopping experience with something for everyone called The Queens MarketPlace within the Waikoloa Beach Resort. 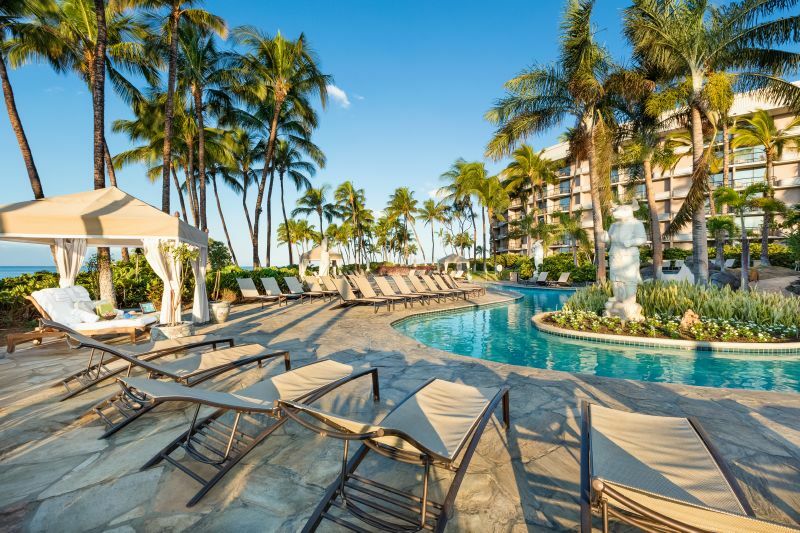 With an exciting collection of boutiques, galleries, shops and services, plus a delightfully diverse Ono Food Court, upscale restaurants and a full schedule of free Hawaiian cultural activities and entertainment. 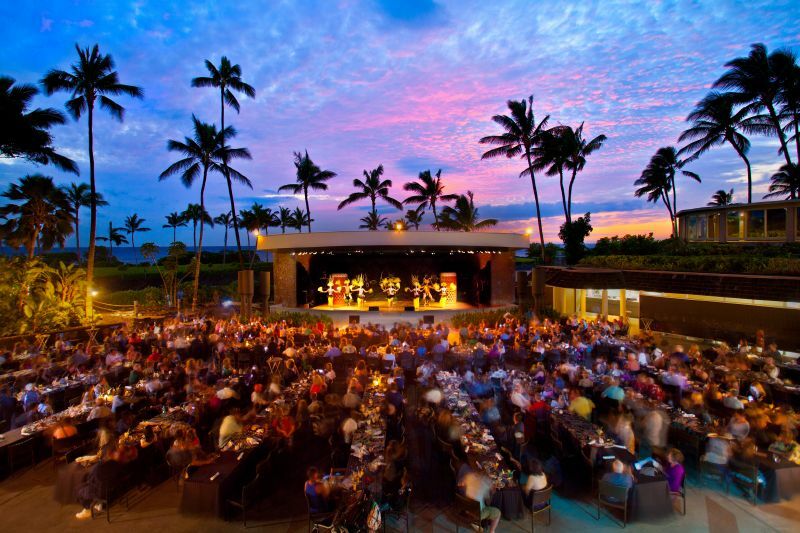 After the marathon at Hilton Waikoloa Village, The Host Hotel, is The Big Island Luau. How fun, right? We will go there to celebrate so many things like Mark’s 50th state, My Honeymoon and seriously, just being alive. 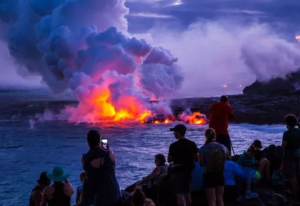 I’ve heard it’s an exhilarating experience, under a magical Hawaiian night-sky and swaying palms, featuring exotic dance, music and entertainment for the whole family with hula & fire dancers and a lavish Hawaiian buffet. E ‘Ai Kākou! (Let’s Eat!) 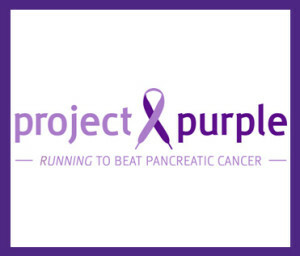 This year I will be representing Project Purple! 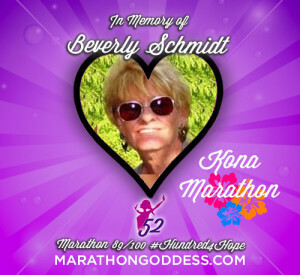 Grateful my running continues to help the fight against pancreatic cancer with this amazing charity so close to my heart, who’s motto is “Running to Beat Pancreatic Cancer!” Please Click here to make a Donation Click here to register for the 2015 Kona Marathon Remember to use code KMGODDESS to save! Looking forward to seeing you in the Land of Aloha June 28th! xo Julie We Got This! !